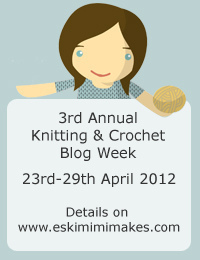 This week is the 3rd Annual Knit and Crochet Blog Week! This means that every day for an entire week, participating bloggers from all over the world will be blogging about the same topic. You an find the other participating blogs easily by searching the internet for the code of the day. Today's topic is Colour Lovers and the code is 3KCBWDAY1; the rest of the week's topics and codes can be found here. Some of the topics will be a challenge this week, so I'm glad to start off on one that's easy for me. I love colour. I especially love the spectacular colour palettes of certain yarn brands: the deep, rich, vibrant colours and the light, bright, fresh colours - I love them all. I could spend hours upon hours searching various online yarn stores deciding what my favourite colours are and imagining what I could make with them, but for some reason (probably the fact that I'm a cash-strapped student) I never actually buy. What surprises me even more is that as much as I'm taken in by these colours and would love nothing more than to knit with them, when it comes to actually buying yarn for a particular project I lean towards more natural tones. I have the Aidez cardigan in my queue and plan to knit it for the autumn, but I feel like the beautiful textures will be seen so much more clearly if I knit it in beige. And anyway, Aran always looks good in naturals. I want to buy more of those amazingly coloured yarns I spend all my time looking at, but I don't get to buy yarn often. My "stash" consists of enough Aldi yarn for three pairs of socks, and four skeins of some Bergere de France I picked up in the bargain bin. I only want to buy yarn if I'm ready to cast on for a specific project, which means I'll only buy a colour if it's perfect for a pattern I'm about to knit. The last thing I want to do to a beautiful yarn is to commit to it, then not know what to do with it and leave it sitting idly in the back of my wardrobe. Funnily enough, my unused stashed yarn is all beige or grey - this might be why I'm not so excited to knit with it! I think this is one reason sock yarns come in more colours than any other type of yarn. It's not such a commitment to the colour if you only need one skein for a project. Also if it doesn't turn out great, the socks won't be on show as much as jumper for example (that means sweater to you Americans). It was with this logic that I took the plunge earlier today and bought my first variegated sock yarn. (If any non-knitting friends have stuck with me this far, a variegated yarn is one that changes from colour to colour as you knit.) I think a variegated yarn is a gamble: while the colours might look gorgeous on the skein, you never know exactly how they are going to look once they knit up. I'm very cautious about picking the wrong yarn, but as soon as I saw a Three Irish Girls sock yarn in a colourway called "Maeve" I had to buy it: the yarn and my sister have the same name! It also seems to be a much more luxurious yarn than the Aldi stuff I'm used to, so I'm really looking forward to knitting her a pair of Maeve-coloured socks! Find other Knit and Crochet Blog Week posts about Colour Lovers here. Thank you for reading and taking the time to comment :) I'm thinking of doing the Aidez cardigan in a foresty green now, thanks for making me reconsider! I find it hard to find a good, st pattern for variegated sock yarn but I did knit Cookie A's Monkey socks which uses variegated and solid. I'm looking at the Skew socks, I think they make variegated yarn look fantastic! Love Cookie A's designs but I'm trying to stick to free patterns for the moment.